A "deluge of illicit drugs" has fuelled violence, debt and self-harm at a men's prison, a report has said. "Chronic" staff shortages are to blame for many of the poor outcomes at HMP Bristol, chief inspector of prisons Peter Clarke warned. One in seven inmates said they had developed a drug problem while at the prison, which was far higher than at the time it was last inspected. 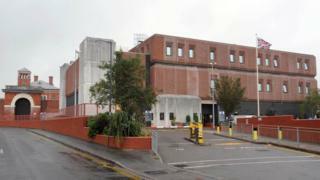 The prison service said robust action was being taken to tackle the problems. The report follows an unannounced inspection of the category B prison in March. It said the use of the new psychoactive substance known as spice was "particularly problematic", while the average positive rate from random, mandatory drug testing was "exceptionally high". Mr Clarke said there was a "history of underinvestment" in the prison. "This had coincided with a deluge of illicit drugs, fuelling violence, debt, self-harm and physical and mental illness among prisoners," he said. "The lack of staff and the poor physical environment on the wings had merely added to the problems." The inspectors noted "some grounds for cautious optimism" saying relationships between staff and prisoners were reasonably good and much good work was being done to support prisoners being released. Michael Spurr, chief executive of HM Prison and Probation Service, described the situation as unacceptable. "Funding has been increased and more staff, including an additional 29 prison officers, are being recruited," he said. "Work to improve safety, reduce violence and improve first-night arrangements is being prioritised." Mark Fairhurst, acting chairman of the Prison Officers Association, said staffing levels needed doubling. "That would enable you to carry out searching every single day, it would enable you to do wall patrols to stop the drugs getting thrown over the walls, and it would enable you to run a full regime and have prisoners engaged in purposeful, constructive activity," he said.